LED strip lighting is a a great addition to your kitchen. Under bench, under cabinet and kick board lighting provide subtle and effective lighting and is great to leave on at night. LED lights come in numerous colours to suit your homes decor and often strips are compete with adhesive backing, making then easy to apply to most surfaces. Most LED strip lighting is waterproof, meaning that outside mounting is completely safe. LED strip lighting is brilliant for both decorative purposes as well as a functional light source. LED lights are free from toxins such as mercury that traditional compact florescent light bulbs (CFLs) contain. LED lights let of very little heat meaning their fire risk is significantly reduced. LED lights use a lot less power than traditional bulbs, so expect your power bill to be a bit lighter! With all the benefits of LED lighting we are sure that you will be rushing out to purchase your own. Here are a few ideas of how you can utilise these multi-purpose functional lights around your home. Put your friends and family under the spotlight they deserve! With a bit of simple DIY, insert a row of strip lighting into a box frame and you can sure your photos are bright and visible day or night. There is no need for your kitchen to be dark and dingy. LED strip lighting is a great addition to your kitchen. Under bench, under cabinet and kick board lighting provide subtle and effective lighting and is great to leave on at night. 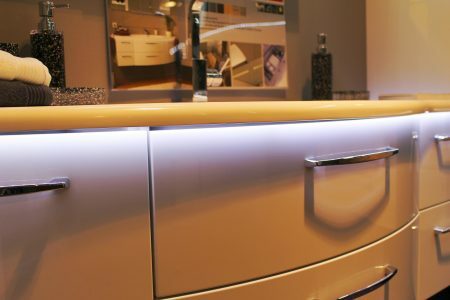 By adding a LED back lit splash back you can create a contemporary cooking space your guests will love! Open-riser stairs are making a comeback and are now seen in many new builds. However their gaps can be especially treacherous at night. Installing some strip lighting underneath each step is a cheap and easy way to light your path at night and save your blurry eyes having to adjust to fully fledged lighting. Getting that lightening right can be a real challenge but by using some strip LED lighting you can create a subtly lit mirror. In the bathroom accent lighting can be used to highlight the area around the mirror. Floating shelves and shelving units look the part with neutral coloured strip lights lining the underneath of them. Their slim profile makes them great for these applications and turn shelves from organisational objects to display units, letting you showcase and highlight your family heirlooms. You can use LED strip lighting in kid’s bedrooms in a multitude of ways. Their low heat and low fire risk makes them great for night lights meaning that you never have to stand on a sharp toy again! Creating ambience in a room can sometimes be tricky and expensive. Placing LED lighting strips under your couch or coffee table can help to create a relaxing environment you will be sure to enjoy. Plus, finding stray socks and coins will no longer be a problem! LED strip lighting is perfect outside due to its waterproof nature. Extend the length of your days outside by switching on the lights on the patio or deck. Strip lighting is easy to install and could be installed either at foot level or along eves. LED lights can even be used in pools – although you may want to enlist the help of an expert for these ones.